First, the EASD debate is extremely pressing, for the very specific reason that it’s closely tied to the overarching need to stabilize the global climate system as quickly as humanly possible. Not to get into the science, or the convolutions of the negotiations, but the bottom line is that the atmospheric carbon concentration is entering the red zone, while emissions still continue to increase. These emissions have to peak, and fast, and that peak has to come not as a temporary recession-linked downspike, but rather as the beginning of a long and sustainable abandonment of carbon-based fuels. Which is the whole point of the EASD debate. Rewind back to 2010 in Cancun, where it was formally and publicly recognized that the imperative of a rapid emissions peak was inextricably linked to an equally imperative need for economic development and poverty eradication in the developing world. Keep this connection in mind during the next few years, as the next round of negotiations (2012 to 2015) runs some very rough waters, and as the North’s all-knowing pundits point the finger of blame at the South. Which – absent some reason for trust, especially on the all-important question of economic development in a climate-constrained world – will continue to refuse to agree to a global peak year. 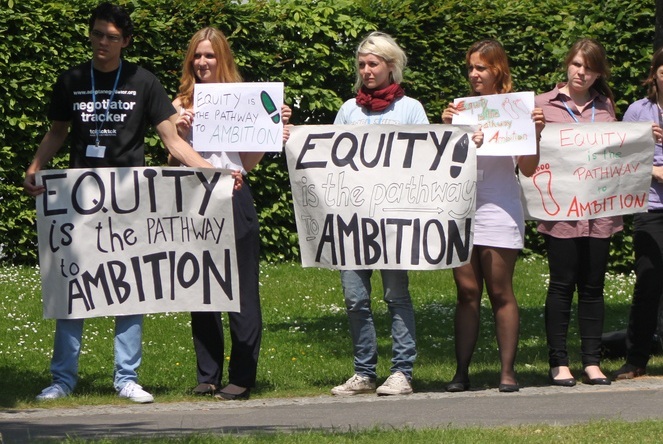 The equity workshop began in earnest when Sivan Kartha, a senior scientist at the Stockholm Environment Institute, in the first of the workshop’s two introductory presentations, laid out the stark logic of the equity-to-ambition link. Kartha showed that, if we’re to avoid climate catastrophe, developing-country emissions will have to peak while their per-capita incomes are still extremely low. This, in a way, is the whole problem, or at least the part that’s visible above the surface. It highlights and clarifies the nub of the climate dilemma, the core dilemma that must somehow be faced if we’re to make EASD real, and by so doing break into a more capacious negotiating space. Kartha is an author of the Greenhouse Development Rights framework (full disclosure, I’m another), as well as a coordinating lead author of the IPCC’s Fifth Assessment Report (Working Group III, Chapter 4, Sustainable Development and Equity). If you’re following the climate equity debate, definitely click through to his presentation (at the start of the first stream) or at least download his slides, or see this summary of his talk, on the Stockholm Environment Institute’s website. Martin Khor’s presentation (see the first stream; see a written version version of his argument here) focused on the implacable arithmetic of the global carbon budget, and on its implications for not only developmental justice but adaptation as well. Khor, the director of the South Center, specifically argued that equity is the gateway to ambition. The South Centre is extremely influential among developing-country negotiators and within southern civil society, so Khor’s position matters. It’s worth noting that he went out of his way to talk not only about “common but differentiated responsibilities,” but about “respective capabilities” as well. This was much in contrast to the Chinese presenter, Professor He Jian Kun (see the first stream) who was similarly insistent on the importance of historical responsibility, but pointedly (and perhaps shortsightedly) silent when it came to capacity. Arthur Runde-Metzger, speaking for the European Union (see the second stream) was the very model of a green diplomat. To be sure he had it easy – he represents a political bloc that, on this issue at least, is in touch with reality. His key point was that we need a global framework that is both fair and dynamic, one designed for the ongoing, rapid change of the world economy. Frankly, it was a relief to hear a high-level negotiator state this rather public secret from a plenary stage. Lately, we’ve been drifting into a situation in which high-level calls for new global architectures (Todd Stern comes to mind, as does Robert Stavins) deliberately avoid the “fairness” problem. So the EU deserves credit for taking the focus off the drive for a “binding” accord (which, frankly, we’re not going to get without a real and manifest increase in finance and technology support) and putting it on the need to negotiate a “dynamic” approach to global differentiation, and for further arguing that such a dynamic approach also could, and must, prioritize the imperative of sustainable development. (One criticism should also be noted: Runde-Metzger came come off as altogether too optimistic, when it came to the keystone problem of “decoupling” developmental opportunities from carbon emissions). How could anyone fear such a search for rough consensus? The answer (Pershing’s words again) is that the realists feel that an “overly narrow” approach to equity “will likely drive us away from an agreement.” Here, it might help to be a bit more blunt. What the realists actually believe is that “equity” is a purpose-made playground within which negotiations would be drawn out forever, purpose made because the wealthy countries will never accept any even minimally fair definition of their fair-share obligations. Which is of course a perfectly reasonable belief. The strange thing is that the realists, and certainly their representatives in the negotiations, often conclude that, by insisting on equity, it’s the developing world that’s negotiating in bad faith.